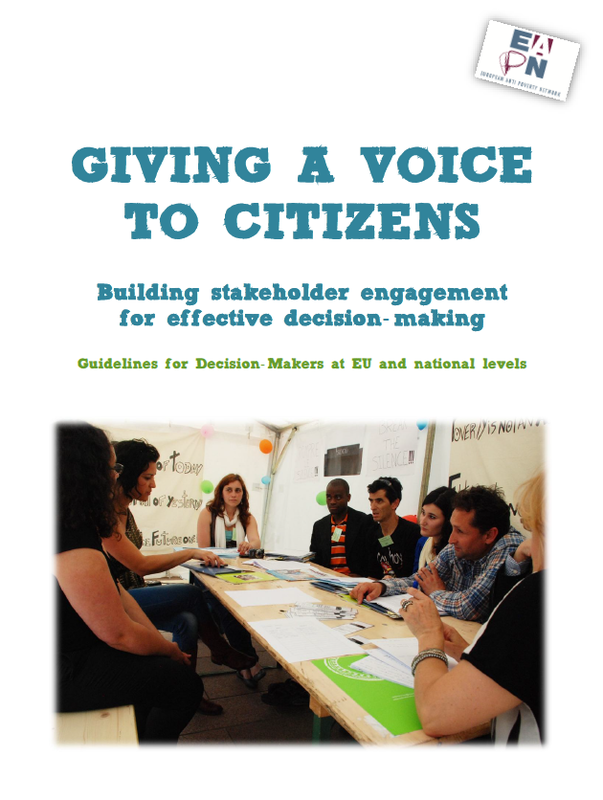 01/10/2014 – Today, EAPN releases its handbook Giving a Voice to Citizens, addressed to EU- and national-level policy makers to help them build stakeholder engagement dialogue; ie effective decision making, that take into account all the different parties or groups impacted by the policies concerned. The handbook provides common principles, concrete tools and tips and draws on concrete practice at EU national and local levels for authorities to apply and get more effective decision-making processes. Today the credibility of the EU and the fight against poverty are facing a serious crisis: the EU and the member states are not at all delivering on the poverty target of the Europe 2020 Strategy (lifting at least 20 million people out of the risk of poverty), on the contrary, over 8 million more people find themselves in a situation of risk of poverty! An effective implementation of the Europe 2020 Strategy and anti-poverty policy is therefore necessary and urgent. While there are some signs of economic recovery, Europe’s social crisis continues. Some Member States are still facing a social emergency and inequalities within and between Member States are growing. Due to the long Eurozone crisis, we have not managed to get closer to our Europe 2020 objective of lifting at least 20 million people out of poverty and/or social exclusion. Quite the contrary, the number of people at risk of poverty and social exclusion in the EU (comprising people at risk of financial poverty, experiencing material deprivation or living in jobless households) increased from 114 million in 2009 to 124 million in 2012. This makes it more urgent than ever to find and implement real solutions to the monetary problems of the EU. Member States need to concentrate more efforts and resources on job-creation and the fight against poverty. However, a real difference can only be made if the policies, their design, and implementation are made in close cooperation with social service providers, civil society and people experiencing poverty. The ongoing review of the Europe 2020 Strategy provides us with a new opportunity to draw lessons from the crisis years and outline the necessary actions at European, national and local level. László Andor, European Commissioner for Employment, Social affairs and Inclusion. EAPN believes that developing effective anti-poverty policies largely depends upon asking the right questions and finding the right answers. This means putting into practice an effective participative process which can harness the expertise and know-how of all key actors. The opinions and solutions coming directly from people with direct experience of poverty are therefore key. Regular dialogue and engagement with civil society however is not only crucial for achieving positive policy solutions, but is essential for providing accountability and legitimacy to government’s policies. The EU initially took some steps in the right direction of promoting such participative civil engagement, through the Social OMC, particularly in the National Action Plans for Inclusion. The new playing field of Europe 2020 with the National Reform Programmes, and the European Platform Against Poverty seemed to offer positive opportunities for good engagement, however it is widely acknowledged to be delivering this engagement weakly. Whilst the Common Principles on Stakeholder engagement were promised in the European Platform Against Poverty,little progress has been forthcoming. To help change this situation, EAPN (the European Anti-Poverty Network) drafted this handbook, offering guidelines for effective stakeholder engagement. The handbook aims to contribute to this important objective by providing common principles, concrete tools and tips to help policy makers take the important step of putting effective stakeholder dialogue into practice, drawing on concrete inspiring practice – at the EU, national and sub-national levels. We are explicitly referring to the framework of the Europe 2020 Strategy and specifically the poverty target, developed through its instruments (National Reform Programmes, National Social Reports, the Country-Specific Recommendations, the European Platform Against Poverty, The European Convention, National Platforms against Poverty and Social Exclusion, …). Nevertheless, we have the ambition with this booklet to offer tools that reach further than only stakeholder engagement in the field of social policies and policies with a direct visible link with the fight against poverty. Other (macroeconomic) policies can also have a major impact on the fight against poverty, which means that also in these fields, stakeholder engagement in general and the involvement of people with direct experience of poverty and the NGO’s working with and for them is both useful and necessary. We hope this booklet will inspire decision-makers at all levels to take the next step to drive forward genuine and effective stakeholder dialogue with the people who bear the brunt of the policies. This handbook addresses the development of consensus-based effective stakeholder dialogue. Of course, EAPN also uses other ways to engage, other forms of effective stakeholder participation such as: campaigns, direct action, modelling alternatives, civil disobedience, etc. which are outside the scope of this publication. “The success of the new strategy will therefore depend critically on the European Union’s institutions, Member States and regions explaining clearly why reforms are necessary – and inevitable to maintain our quality of life and secure our social models -, where Europe and its Member States want to be by 2020, and what contribution they are looking for from citizens, businesses and their representative organisations” (EAPN Toolkit on Engaging in the National Reform Programmes). ‘Non-Governmental Organisations working with or for them’: Sometimes these organisations involve self-organized groups, sometimes it concerns Civil Society Organisations defending the rights of people with direct experience of poverty, and working together with them.